A double green-flowered Primula auricula, rarely seen in the US. First, my URL has changed ( finally!) to www.growingwithplants.com. 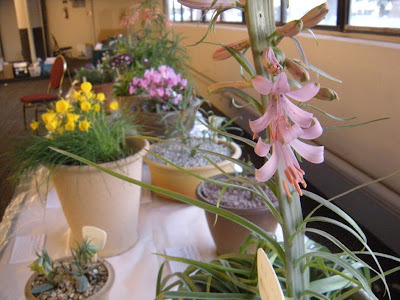 Welcome new readers, to my blog for people who are crazy about collecting rare and unusual plants, or for people who just love plants for any old reason. Hi everyone and new readers, my name is Matt Mattus, and I live and garden in my garden in Worcester, Massachusetts, one hour west of Boston, in USDA zone 5B. I try to post every week on Sundays, and sometimes more. I have a fulltime job, and commute two hours a day, so during the week I guess I am like most of you, busy, busy busy, but on the weekends, I garden. 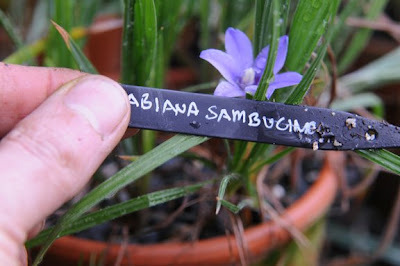 This blog is about my passion, my garden, greenhouses, and plant collections. 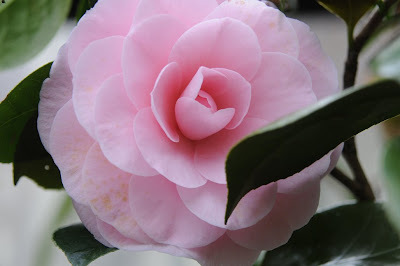 I hope you find it interesting, since it is not just about everyday gardening, since I have been a plant enthusiast since I was 5 years old, so things have progressed! Every year, it's something different, and every year, my obsession gets worse. I passed through my daylilly and hosta phase when I was in highschool 30 years ago, so I am about due to pass through these phases again! Now, I am in my alpine garden/trough, rockgarden/rare japanese collectable plant phase. 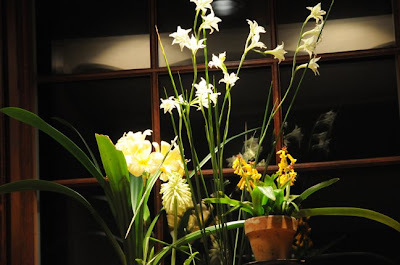 With a good dash of South African Bulbs ( winter blooming ones). Yeah..clearly this blog is for those who are bored with what is common, and to those who are looking for something new to grow. I am all about impressive plantings, amazing color combinations, and garden design too, so perhaps you will get some inspiration. But mostly, I am an opinionated gardener, even a plant snob, so prepare yourself-especially if you love bushel basket mums. Actually, there isn't a plant I don't like, and in fact, I have a soft spot for forgotten plants, violets, primroses, old fashioned vintage plants......antique iris, sweet peas, dahlias, glads, annuals, so anything goes. I invite you to look back at the various postings over the years, and see if it all interests you. 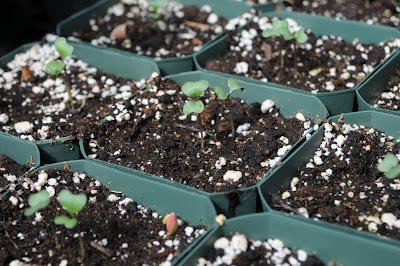 Some vintage alpine auricula primroses, on the back porch waiting to be planted. The beautiful high alpine primrose, Primula allionii native to the alps. 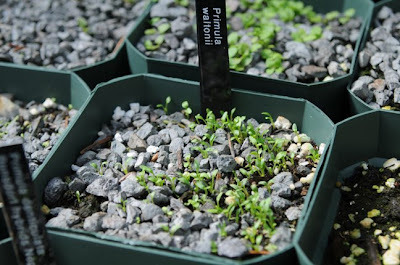 Over the next week, you will see some changes with my blog, Growing with Plants. 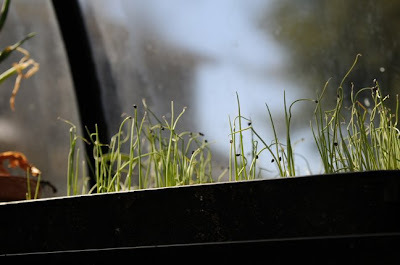 After three years, I am moving the blog to the URL that makes more sense, www.growingwithplants.com SO If you have bookmarked the old Blogger Exploraculture.blogspot URL, you will need to change it. 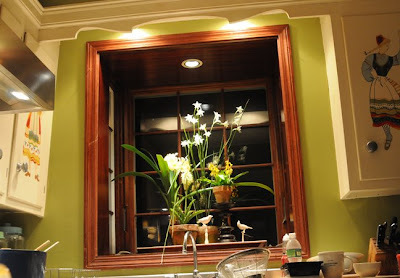 Also, I have joined the garden blog site, Blotanical.com ( see right). 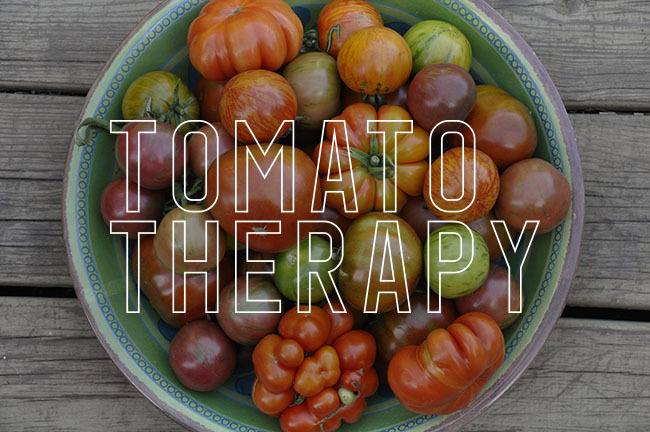 This will allow me to get many more readers, and will also connect me (and you) with a slew of other garden bloggers ( thousands more), so please go check it out. 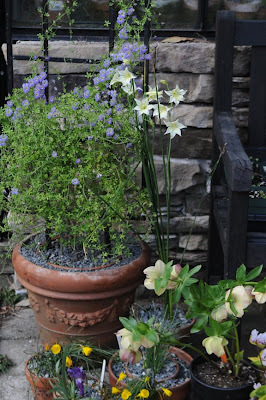 I am still relatively new to this garden blogging scene, but slowly, I am getting the hang of it. Although, I still need to figure out how to respond to people, and to spell! My alpine wall in April, with phlox, species tulips and Androsace. 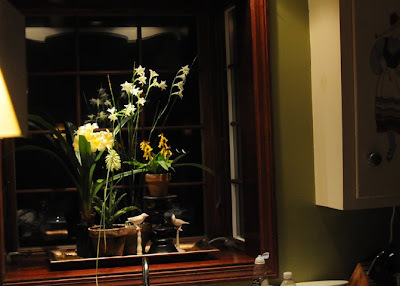 To new readers of my blog, welcome, Growing with Plants is different than most garden blogs, since it is targeted towards the plantsman ( plantswomen too), and to those who are more obsessed with plants. 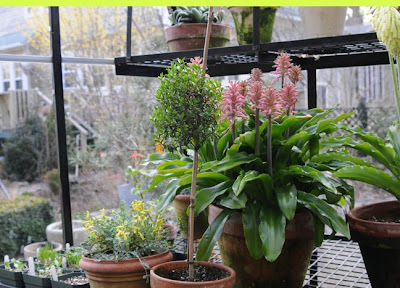 As a member of many plant societies, this site will appeal to you especially if you like unusual or rare plants, South African Bulbs, keep a greenhouse or alpine house, grow alpine plants, bulbs in pots, unusual perennials or rare houseplants, beautiful rare flowers, amazing common flowers that have fallen out of favor, creative summer containers or gardens, and more. 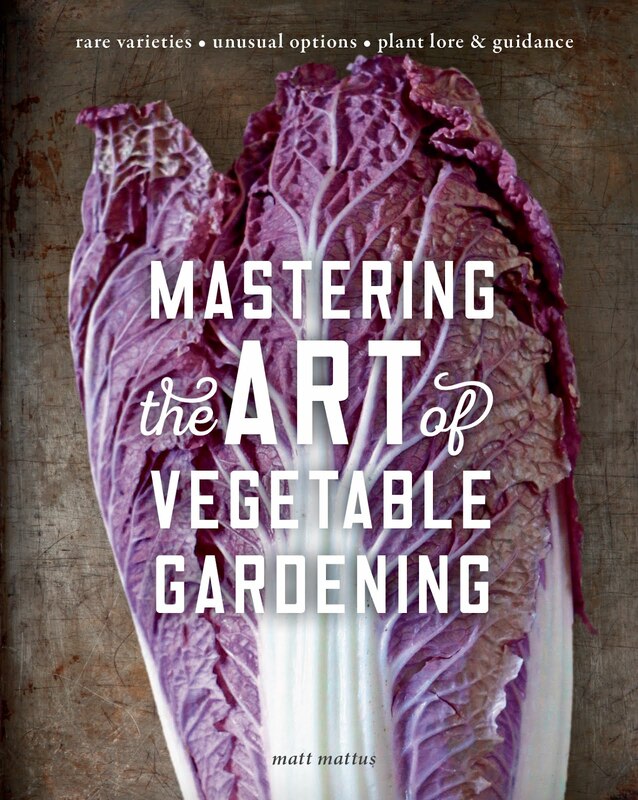 I live and garden in Worcester, Massachusetts on 3 acres of land that has been in my family for over a 100 years. 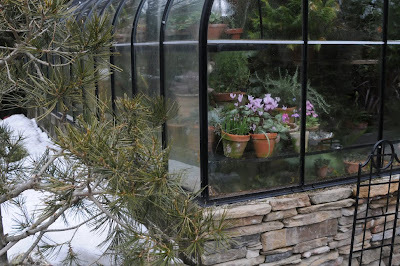 I keep two greenhouses, a large glass house where I grow all sorts of bulbs, south african plants, Lachenalia, Clivia, as well as many other types of plants that all share the same space, and a smaller alpine house where I grow Saxifrages, Primula and various alpine treasures that need the protection from rain. In the garden, there are various perennial borders, a blue and gold garden, an few alpine raised beds, an ephemeral garden for Corydalis and Hellebores, anemones and various woodland plants, water gardens, crevice and rock gardens, and many more. 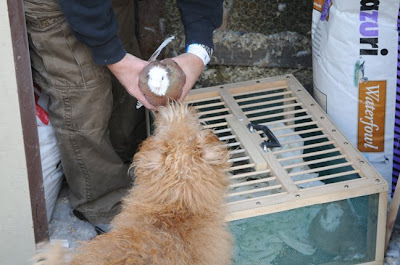 We also keep show pigeons, breed rare ducks, Irish Terriers, keep some tortoises, doves, Parrots and other various animals. Check in frequently to see what might be new, either blooming in the greenhouse, or in the garden. As a professional designer, I travel frequently to Japan and Europe, and will sometimes post side trips from these locations which might be of interest, Mostly, I am a plant geek, an obsessive plant collector who moves interests from plant to plant, depending on my mood. Last year I focused on Dahlias, the gold and blue garden, tuberous begonias, fragrant parma violets, and Japanese orchids. 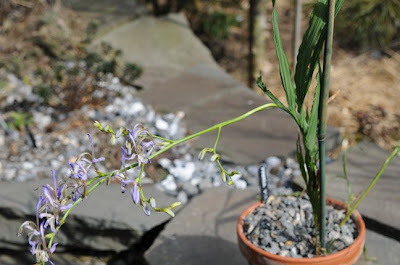 This year, it seems that I am moving towards new siberian Iris, japanese maples, flowering cacti and Haworthias, Calochortus bulbs and Pleione orchid bulbs, to name a few. A spring rainbow....even though there are heavy snow squalls outside of the glass, today. 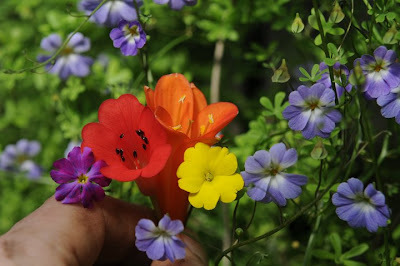 From the left, Primula malacoides,Vireya 'Valentine;, an interspecific Clivia, a yellow Primula x Kewensis and Tropaeolum azureum. I am still celebrating that my Tropaeolum azureum is blooming, if you read in my last posting, I had believed that it was a T. tricolor ( still nice, but not a precious as this is). These are all tuberous Nasturtiums, good for cool greenhouses, or in protected areas outside in California. Worth seeking out to try for something different. My 'Mystery Freesia' or is it something else? 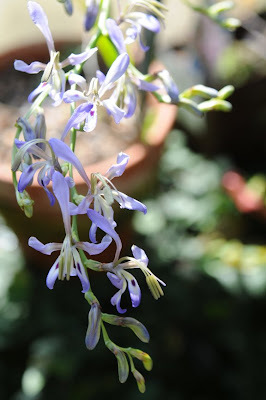 Is is a Lapierousia alata or a species of Freesia or Amenotheca? Help.... This was a packet of seeds from Silverhill Seeds in South Africa, labeled Freesia viridis, but clearly it isn't. Any clues out there??? The crazy Bowea tutor that I planted two weeks ago, is starting to become more interesting. I love the way the new sprouts all grow in the same direction, it looks as if it is seaweed, so coral at this point. Primula x kewensis now blooming in the greenhouse, a tender primula. Every March, the greenhouse almost has too many flowers in it. 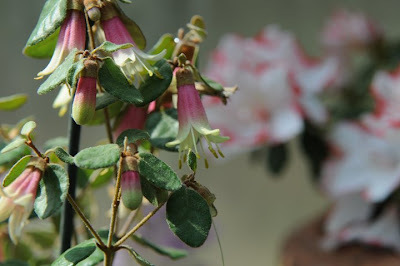 Some new tender shrubs that I bought for the greenhouse include this Correa 'Western Pink Star', from Gosseler Farms' table at the NARGS meeting. 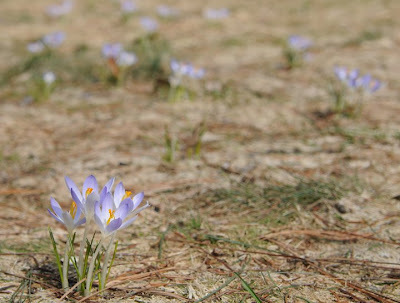 I once saw a photo of a lawn, on the Scottish Rock Garden Society site, completely covered in crocus, so in our old golf green, I planted a few hundred bulbs of a singular species, (for a more natural look, like we saw in the Alps). These 'tommies' are already open, even though the ground here is still frozen. Now back from the west coast, the NARGS ( National Rock Garden Society Meeting and Western Winter Study Weekend) and a week of intense catching-up at work, a 50 year old reward of a colonoscopy, two days of not eating, lost two pairs of glasses, cracked the windshield on my rental car with a rock on the Oregon roads, two fire alarms at 2:00 AM and 3:00 AM at the hotel before I had to leave at 4:00 to arrive at the airport, the lost pair of readers that I had to buy to read magazines on the plane, and a bit too much stress from the NARGS Annual Meeting and politics...frankly, I am glad that I am home, in a very brown New England, even though it is cold outside, it is sunny, and it is home. At least while in Oregon, I had one evening to meet my oldest brother for dinner, and one evening to meet other family members like my niece, and her children and mom. I need to go to Oregon for a longer visit, for I never had the chance to go hiking with a friend, nor time enough to explore. Maybe July, when I can climb Mt. Rainier or Mt. Baker. The NARGS WWSW itself, speakers and all, was overwhelmingly inspirational. It was nice to see Ian Young from Scotland again, and John Lonsdale, we even had time to jog over to a new Chipotle for tacos at a lunch break (johns site for his home, Edgewood Gardens makes me so jealous - but it is inspiring!. I tried to scoot over to the plant sales area at every opportunity, and although I only had two suitcases, I couldn't help myself. At out taco lunch, John asked me if I saw the yellow and peach Hellebore at Gosseler Farms ( I did, there we're two), and he admitted that he 'had to buy one and find room for it) ( leaving one), (which now I had to buy). ( In a one gallon container). (That weighed about 5 lbs). Rhodohypoxis 'Goya', a new double form. Other things that I found room for, was this pretty little Rhodohypoxis, a double one apparently from a rare plant nursery in England, this Rhodohyposis baurii hybrid called "Goya" was cute enough that I had to buy it, along with another single variety not yet in blossom. As if I don't have enough of this genus! Rhodohypoxis does very well in my cold greenhouse, and would do well in your garden if you live in Zone 8 or higher, (possible lower if kept bone dry in the winter). 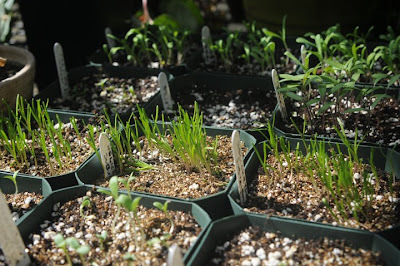 In the greenhouse, I just let the pots dry out in the fall, and shove them under the benches where they can remain cold and dry, without freezing. Every spring, I divide them ending up with so many now, that I just plant all of them in window boxes alone the deck railing. After their first flush of bloom in April and May, which lasts about a month and a half, and virtually covers the plants, the grassy foliage looks neat and very 'fancy-lobby-in-a-boutique-hotel', all summer long. Perfect for those contemporary containers from Target. 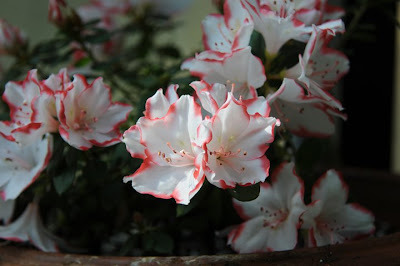 Even our local supermarket had something that I had to buy for the greenhouse, like this lovely little Azalea, unknown variety, but I am low on Azaleas at the moment, so for now, I transplanted it into a nicer and larger clay pot. OK, Harvey Wrightman, you once again are correct. Maybe this should be renamed Eritrichium harvardii ssp. wrightii? 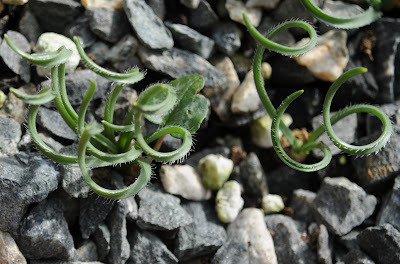 After staying at our home last year during the National Primrose Society meeting, Wrightman Alpines owner and friend, Harvey Wrightman presented us with a little host gift, this precious little Eritrichium howardii growing in a chunk of Tufa rock. Harv told us that it will grow well in a trough (where I planted it, on it's side) and that unlike it's more challenging Euro-relative Eritrichium nanum, this dude will actually grow. 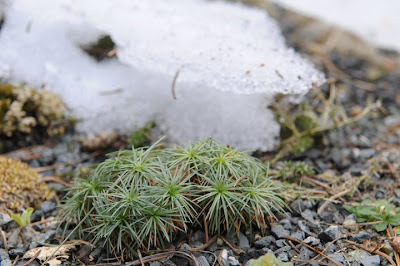 He also warned us that the little guy will shrivel and dry up in the winter, but not to worry, as soon as spring arrives, it will begin to grow- and look! Joy. 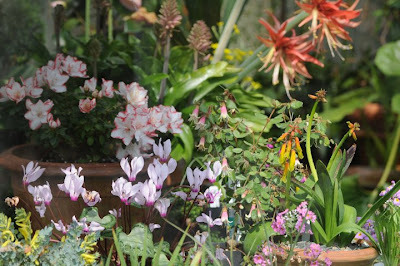 Harvey has pots of this variety on his terrific website for alpine plants, at Wrightman Alpines.com. 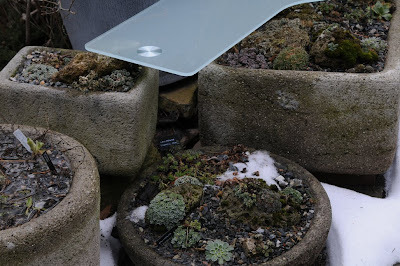 Check it out and maybe instead of a pot of Supertunias® this year, you might plant a trough or stoneware pot of high elevation alpines, THAT sends a message that you are 'green' more than any totebag from Whole Foods could ever hope for! I'l leaving for Portland Oregon for a number of reasons, for a long weekend. I love this city, and can't beleive that it been nearly ten year since visiting it last. Maybe 13 actually!! Not only does my oldest brother live here, and his family, but I have friends and their family here too, so even though I will be very busy until next Monday, I hope to squeeze in visits, dinners and playtime. Leaving home today, it was still clearly winter. Packing the bags on the bed, Fergus knows and does Margaret, that someone is leaving. Of course, they assume both of us are, and since they usually travel with us, even to Switzerland, they know that their beds are not being packed up, and this might be serious. Dogs are so funny. 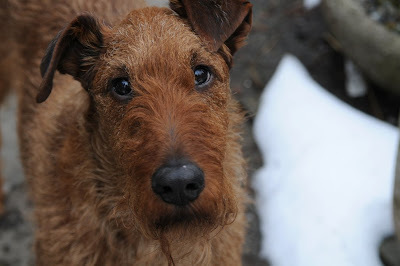 But fret not little doggies, Joe's broken Fibia will be keeping him home for some time! Even from Switzerland! While in Portland, I will be attending the North American Rock Garden Society's (NARGS) Winter Study Weekend. And even which when heard by my cohorts at work, brings snickers, but to those of us who love plants, mark on our schedules as MUST-DO events, not to miss. These weekends are sponsored twice a winter, one in the east, and one in the west cost of the US. The NARGS is a fine group of people of varying horticulutral passion and intellect, friendly and open, and always willing to let new people in to learn about mainly what are known as 'Rock Garden Plants" in the very nineteenth century way that alpine plants, when cultivated in pots and specialized rocky gardens, where known as 'rock gardens' or 'rock gardening'. 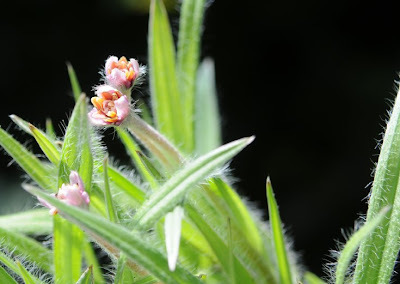 Today, the society name is a bit misleading perhaps, for it encompasses not just alpine plants, but woodland plants, shade and wildflower plants, and honestly, and unusual plant that is not tropical. The definition is a bit blurry, but the group is where most plant-people end up, if they don't graduate to the ORchid Society, it is NARGS where the plant mastery is exercised. THat said, all sorts of people interested in plants are here. 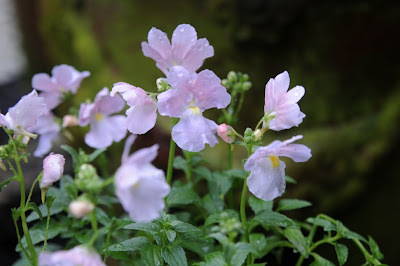 A Fragrant ( Oh...SOOOO fragrant Nemesia 'Opal Innocense" in bloom in the greenhouse, with snow outside. I want to bottle this! NARGS aside, I might hike with some friends ( more on that later) if the weather holds out - I will make time for this, and even skip a session or two, and I have another secret meeting about another botanical venture that I have been working on for 9 years, to see if that will take seed. So this is still a 'work' weekend, anyway you describe it. JOe asked is the snowdrops were out yet, and I told him fo-get-aboutit, since it was 8 degrees F, and still a new foot of snow on the ground last week. But look at what I found in one of the raised rock walls alone the foundation of the greenhouse where the snow piles up when it slides off of the greenhouse. This deep snow reminds me every spring, ( sometimes I am so stupid) when I see all do the nicest Daphne's that I've collected over the years, crushed and broken by the wet snow that slides off of the greenhouse roof. Next year I HAVE TO MAKE PROTECTIVE ROOFS. Which I somehow equate with those 1960's ranch homes in New Jersey near my aunts house, where they clip their foundation plantings into cones and balls, then cover them with painted white or green T-Pees. I need some of those. Besides, I'm starting to wear socks with sandals, and like the look, and I'm 'at that age'. Next...Big Boy Tomatoes behind the garage! Last week I may have mentioned that in a fit of greenhouse chores inspired bu the increasingly warm, radiant spring ( late winter) sun, I decided to reward one of my tuberous Nasturtiums with a nicer pot and trellis for performing so well. One thing I've learned over my years, is that reward and praise will always get you results, whereas discouragement and insults will only get you shut ears. This this weekend too, is about motivation and positive encouragement.....um.....so too, will my best perfoming plants get an upgrade. Not trudy rare, at least to many of us plant enthusiasts, this Tropaeolum tricolorum ( sorry, I'm traveling and too lazy to Google the latin! ), is not only doing well, it's doing spectacularly well, and even after sliding one stony pot into another, and letting it have a trellis instead of a nice twisty piece of manzanita wood that my other peers might use, I rewarded this plant with a recycled $10.00 trellis from Target. Nothing but the best, man! 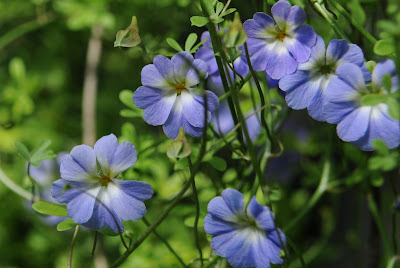 Still, it's cousin, the rarer Tropaeolum azureum, which remained dormant for me, for three or four years now, is indeed growing, and even has some fowerbuds, I am doubtful that it will ever look like this, since it's spindly single vine is only about a foot long, and the aphids seem to really like it. Poor thing. If he ( or she) Decides to try again next year, I may try to wince, shut my eyes, and pinch that single wiry thread-like stem which emerges first like Scottish Rock Gardening Society Plantsman and fellow blogger, Ian Young ( who I will be able to meet this weekend as he is one of the speakers at this weekends' Western Winter Study Weekend), this pinching makes sense, and although I think this is something that is too late to do, I will try next time. 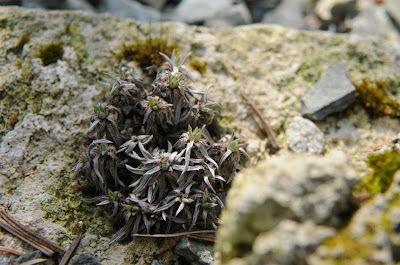 Also, in this photo, in the foreground, is a "sea onion' to those who are familiar with the houseplant. 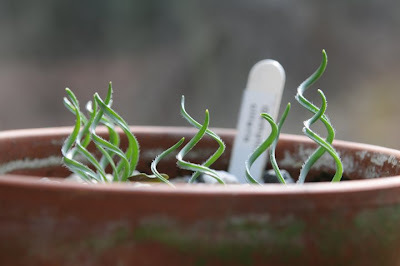 Bowiea volubilis, which is one of those crazy house plants that everyone is atracted to for it's beautiful yet certainly unique growth pattern of twisting stems that have no leaves. It does look like something one would find under the sea. 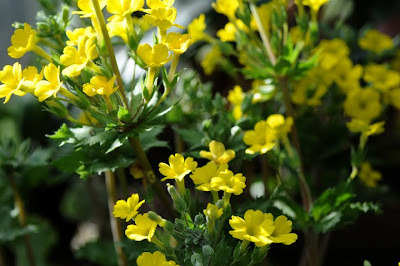 This plant is easy to grow, and does prefer a domant period, which naturally is in the winter, but if you grow it indoors, it will simply tell you when it needs to lose it's top growth and sleep for a while, buy turning yellow and drying up. As long as the "onion part' is still wintermelon green and fleshy, you are fine, and new sprouts will emerge not long after, just keep it dry while resting. This is a member of the Hyacinth family, which is interesting enough, but one can see the similarity when it flowers in it's single blossoms, that are fragrant at night. Bowiea may seem like something that you cannot remember, but since the plant was named for James Bowie, a British plant explorer, just think David Bowie, and you may remember the name better. As you can see, I am growing it on a tuteur, in an experiment on finding a nice way to grow this plant so that I can display it. Left alone, it will just find it's own way, wrapping itself on poles, or on other plants, or around itself. This is one plant than left on its own, can look rather messy. The finest specimens that I have ever seen are those grown on a nice branch of Manzaneta (sp?) wood, which one can find at reptile or pet shops, or in the wild if you live in southern CA. or Arizona. 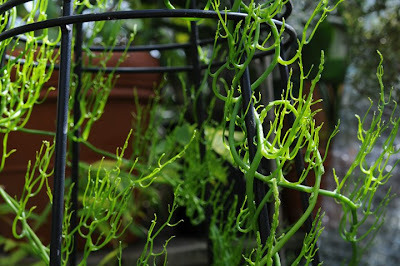 The twistier the better, for Bowieia will not make tendrils, it twists its single terminal stem along what it finds. Be sure to provide something for it to embrace before the more flourishy stems emerge, since they will all instinctually point upwards, and once the rest of the stem-like foliage emerges, the stop growing. 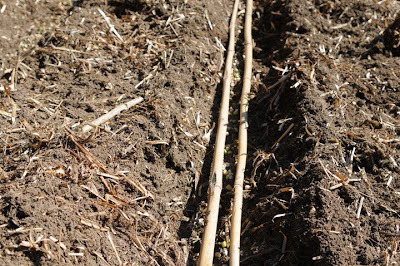 One wants to achieve a natural sweep of growth, and trying to wrap a mature stem around an introduced structure will only result in a messy, bent plant that has stopped growing for the season. So if your plant is already in full growth, it;s prob. too late, and start thinking about providing something cool for next seasons growth to climb on. AS I leave for Portland, the snow is falling again, but spring is not far....right? 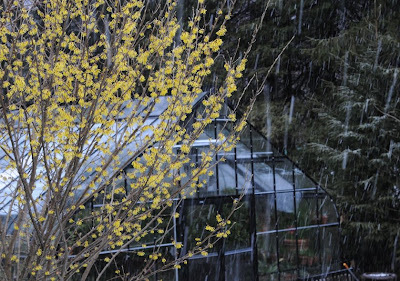 Just look at the Witch Hazel Hamamelis 'Arnolds Promise' whos scent now drift through the falling snow when I bring water out to the ducks. Yay...a week off from feeding the ducks! 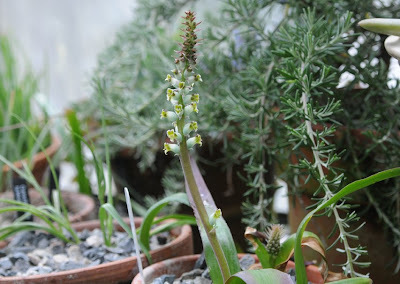 Late Lachenalia are starting to bloom, such as these seed-grown Lachenalia longebracteata, another of the 'green' or teal flowered South African bulbs that are so amazing. I am trying, finally, to grow some Corydalis from seed. Henrick Zetterlund gave me details on how to grow them myself, especially the seed of C. solida, which should be everyones favorite spring bulb outperfoming crocus and tulips. A little pricey from the bulb catalogs, ( but coming down in price) are the many cultivated forms of the Eastern European native Corydalis solida. 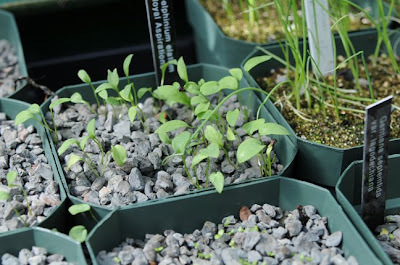 These pots of seed we're potted up in June, of last year, when Joe luckily spotted the seed cases being split open by sugar ants, as they we're attempting to steal the seed for their sweet lipids. Globally, ants disperse many seeds of ephemerals, and this relationship is important for Cyclamen and Corydalis in renewing populations, so killing the ants on your plants is as danderous as saying "no more forest fires in the red wood forests, for these are all natures way of seed dispersal and regeneration. 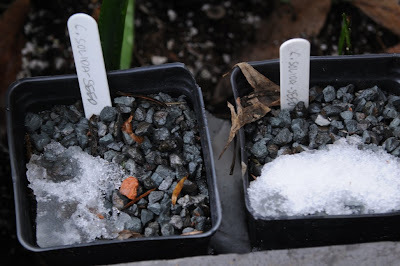 Anyway, these seeds needed to be sown fresh, and then I kept them dry under a large Daphne, just seeing the pots again now, as the snow melts. Not the ideal method, since the pots may have been too frozen, and a cold frame plunge may have been more effective, but we shall see. 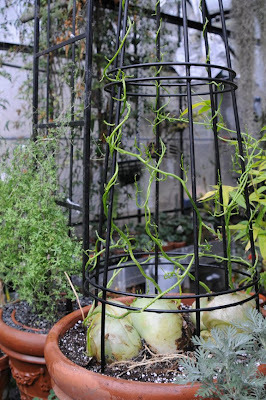 I brought the pots into the greenhouse, and I am letting them thaw slowly. Fingers Crossed. 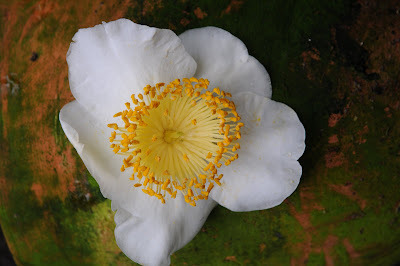 The last of the Camellias are blooming, and this white species ( which I need to look in my note book for the species name( which I planted in the ground in the greenhouse, quite nice with it's boss of stamens. I've had this rare bulb for two years, but they have remained dormant, until this winter. According to Paul Christian, these should have masses of leaves, spiralled around their length and then spirally arranged. 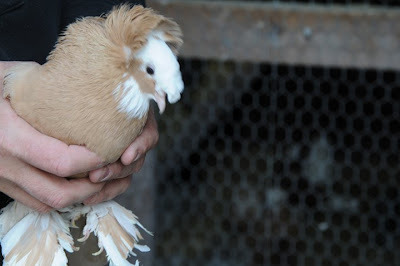 These then, are covered in long white silky hairs on both sides. 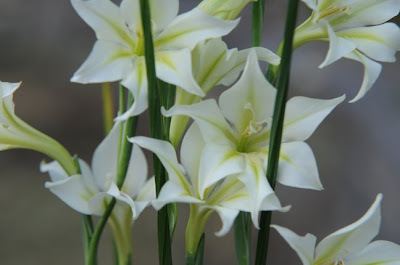 The flowers are large, pure glistening white and very strongly fragrant. 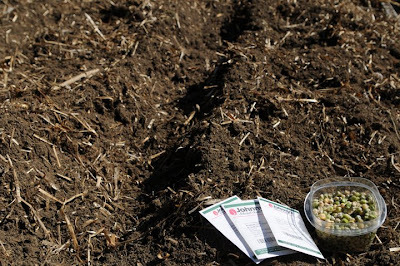 As with all members of this genus very sharp drainage in an infertile, mineral soil is best. We received some new pigeons in the mail, after someone read about the 'Sharp-Shinned' Incident last week. Margaret has to inspect every bird that goes into her loft. This one passed. The species or wild form of the florist cylamen, C. persicum, blooms like crazy in these days which are getting longer every day. The radiant heat of a longer day length, keeps the greenhouse floor warmer, longer, so even when the sun begins to set, the heat causes the glass to fog over, before the furnace turns on. Of course, spring also bring with it Nor'Easter's, we are getting one tonight with 16 inches of new snow expected by tomorrow at noon. 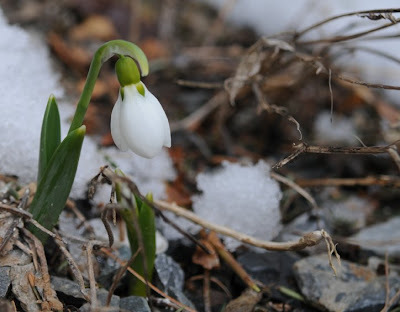 Ugh,but with temps dipping near 0 deg, F tomorrow night, we need the snow cover again, to protect any plants that are starting to emerge, such as the snowdrops, Hellebores and the early crocus. The bees are active again, yesterday the daytime temperatures reached 50 degrees, enough for the bees to go on cleansing flights, the small cup near the door of the hive is full of sugar water, which they can feed off of while the weather continues to shift. 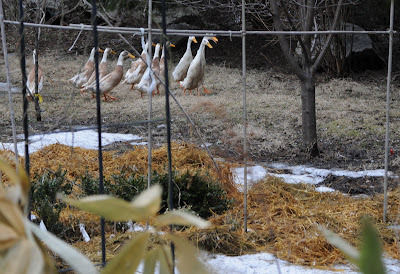 Our Indian Runner Ducks took a run out of their pen today, while I took advantage of the warm weather. As I was spreading manure on the vegetable garden, they ran around, but cautiously remaining in a tight flock, in case Margaret spotted them. 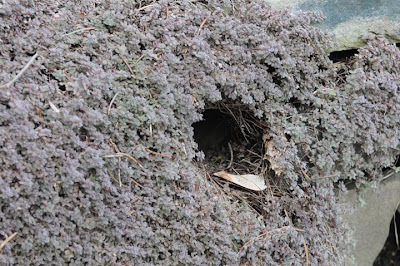 In the rock garden, a mouse, or vole, or something, had made a very nice hole in the wooly thyme. It's so nice to have to ratters like Margaret and Fergus, who rather lay on the bed on the down comforter than chase rodents! A spiny Acantholimon or 'Prickly Thrift', an alpine plant from Crete, this species which I lost the tag,except the 'Crete' part, is a trough but prickly plant, it is handling the rough weather very nicely. 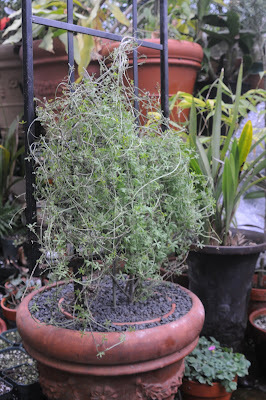 I repotted one of the Tropaeolum tricolorum into a larger pot ( double potting it actually, as to no disturb the roots and tuber). It seems to really want to climb like crazy, so the trellis will help. native to Chili and Bolivia, this species love to climb, and requires a nice branchy support or a trellis. It grows from a potato-like tuber.